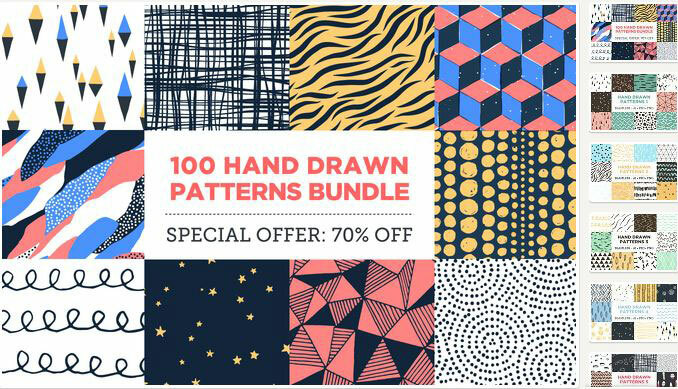 Whether you’re looking for seamless patterns, hand-drawn, geometric, modern or even retro patterns, this list has got you covered! We found some cool, premium-designed, unique patterns with gorgeous details and decided to share them with you. These patterns can be used for various graphic design projects and they will definitely turn any simple design into an eye-catching one. You can use them as background for business cards, wedding invitations, packaging projects, fashion projects, websites, fabric, crafts and so much more! These awesome patterns and textures are either 2D, made by illustrators and designers, or 3D, belonging to real objects. 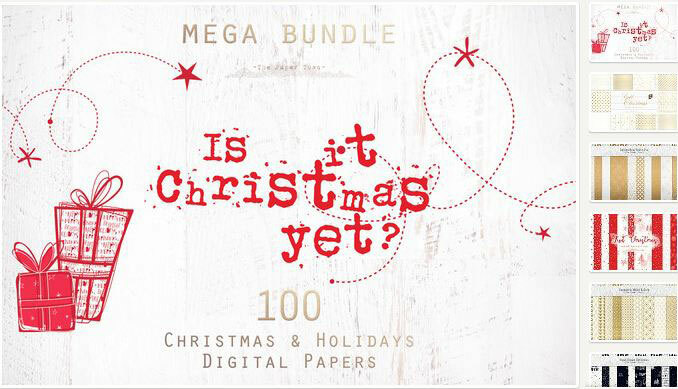 Each set in this compilation contains a variety of popular formats such as .ai, .eps, .pat, .png, and .jpg. Want more? Take a look at these Free Colored Seamless Patterns, Free Minimalist Subtle Patterns, Free Web Design Patterns. This patterns set includes illustrator CC + CS5 swatches, illustrator file with all 100 patterns, photoshop pattern set, and transparent png files. Geometric shapes and textures are widely used in web and graphic design. They can be used for illustrations, backgrounds, patterns etc. 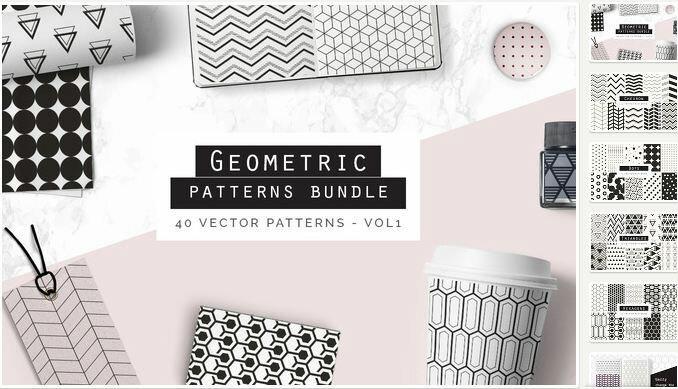 These amazing 40 Simple Line Geometric Seamless Vector Patterns are ideal for adding a light, modern and edgy pattern to enhance your designs. Employing seamless patterns is a great way to give your design some personality. In case you’re not familiar with these terms, A seamless pattern is an image of a texture that can be placed side-by-side with itself without creating any noticeable edges between itself and the added copies. When combining these images, an optical effect is created, that makes the overall picture look continuous or endless. 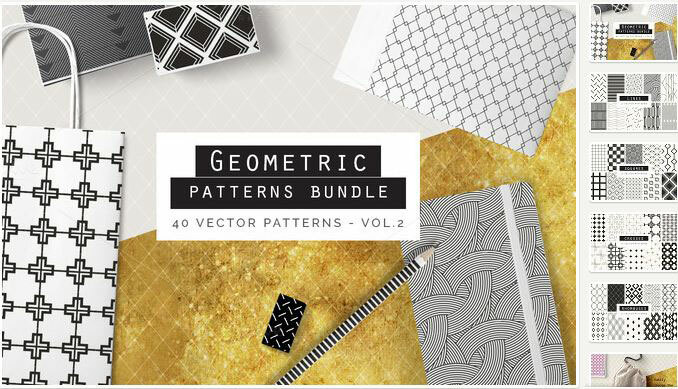 This is a great bundle of 40 geometric seamless vector patterns, which are all vector, so you can make them as large as you want with no loss in quality. They are seamless too. 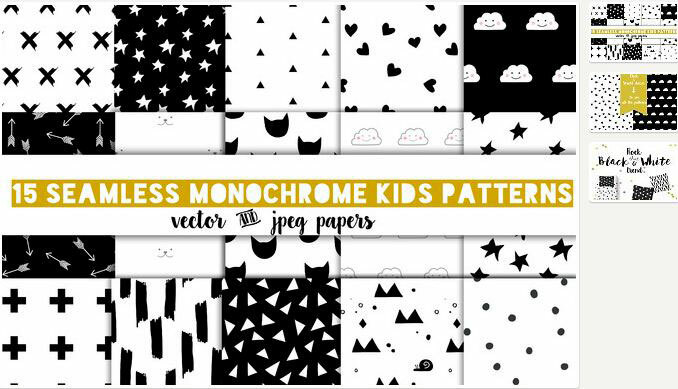 This is a set with 16 trendy monochrome patterns for any project, children’s party, decor, paper, fabric, and much more. 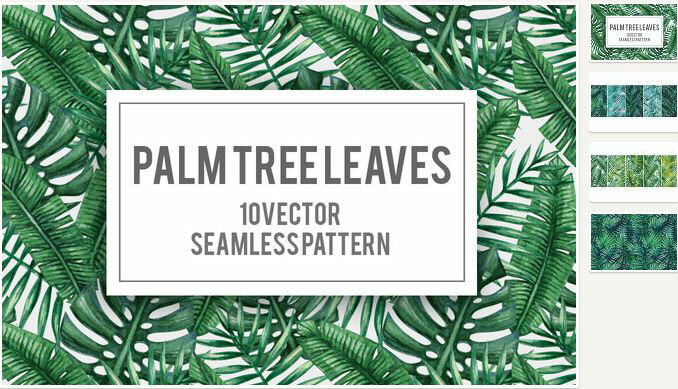 These are seamless vector patterns, fully editable in Adobe Illustrator. Browse through all, select your favorites and use them in your designs. 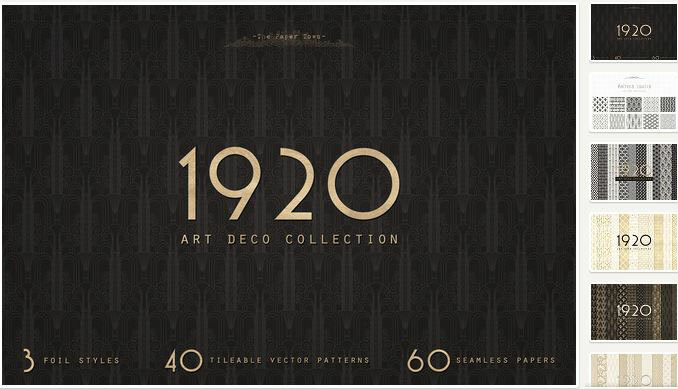 The 1920 Art Deco Collection contains 40 seamless vector patterns. 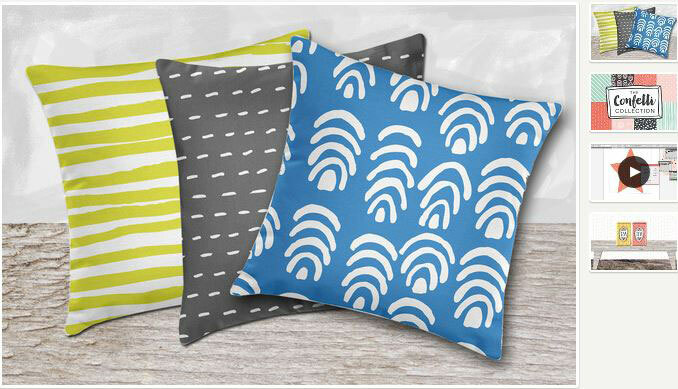 Each pattern is vector-based and seamless. These are available in a PSD file format and will look stunning in your projects. 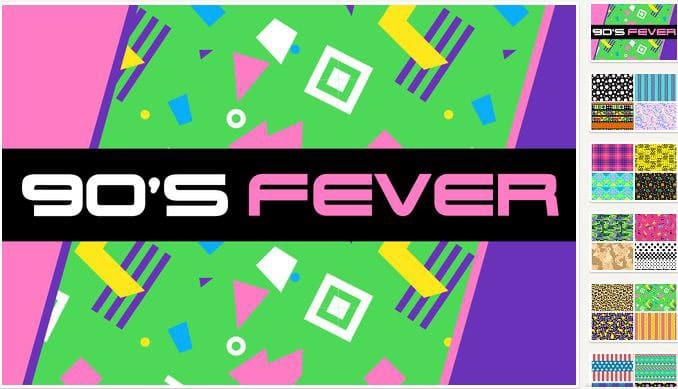 This is a set of funky fresh backgrounds, in the nineties style! This collection of 24 tiled backgrounds is the perfect solution to any 90’s design problem! Check them out and use them as backgrounds, or whatever you need. 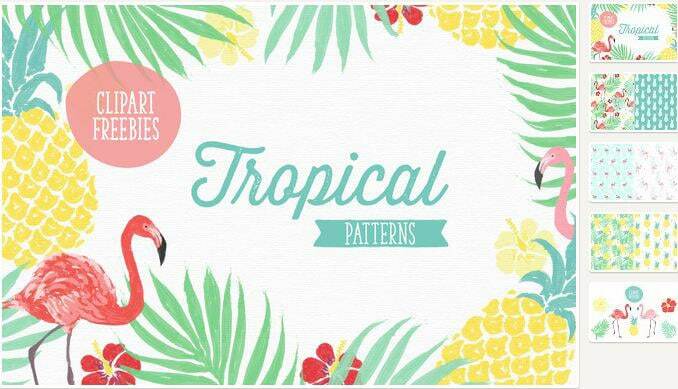 This is a set with 13 Illustrator EPS(10) vector files with vector pattern, 13 JPEG seamless tropical patterns (300dpi) and 11 PNG seamless tropical patterns with a transparent background. This is a free delicate and feminine pattern that you will love. 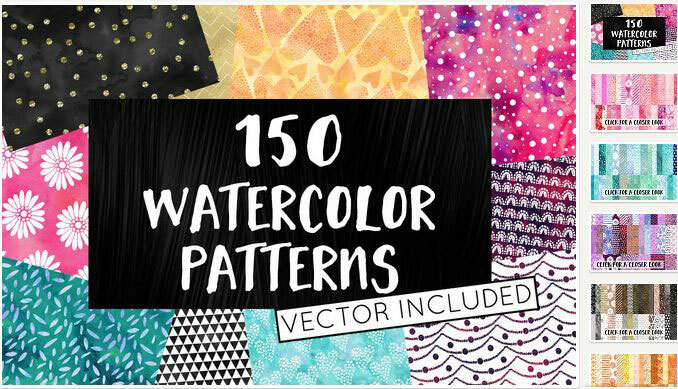 This collection contains 50 hand crafted seamless patterns that can be used to decorate your print designs (cards, wrapping paper), textile (t-shirts, towels, cushions), as well as web designs (blogs, banners, backgrounds), etc. 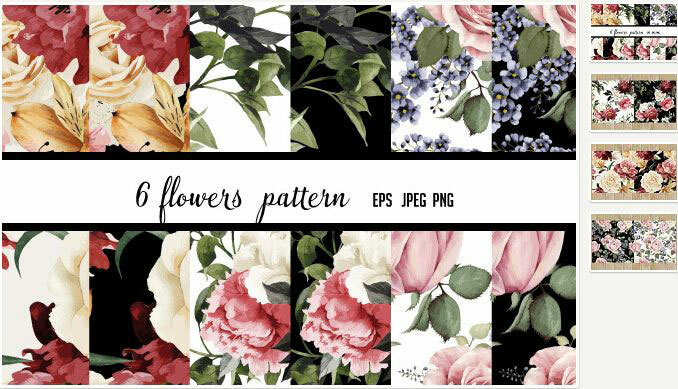 This is a set that comes with 30 Pattern tiles EPS CS3+, 30 Pattern Swatches EPS CS3+, 20 PNG files 12×12″ 300dpi (black design/transparent background), 30 JPEG Watercolor Patterns in various colors. 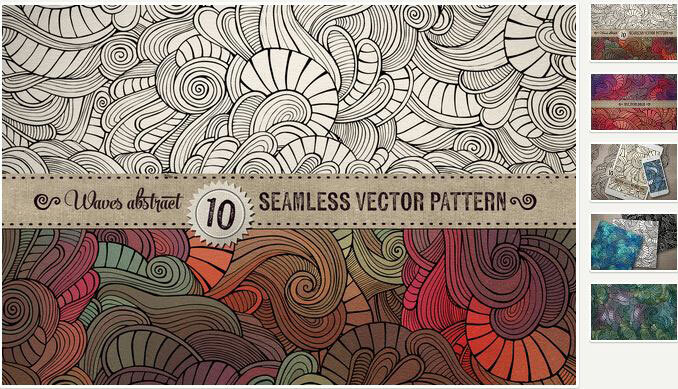 This is a set of 11 seamless abstract hand-drawn waves and curls patterns. You will receive 11 EPS vector patterns, RGB and 11 JPEG files (5000?5000 pixels) RGB. This is a joyful flower pattern that you can use in your projects. This colorful item can be downloaded and used for free. 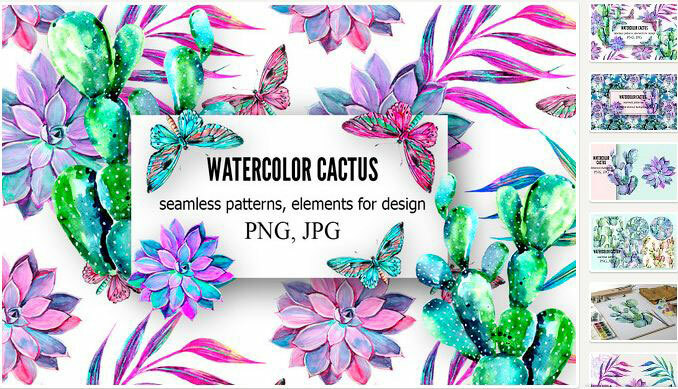 It includes a watercolor cactus isolated on white background, design elements, botanical illustrations, seamless floral pattern background with watercolor tropical palm leaves, butterflies, cactus, exotic bright prints, and more. Patterns and textures are really important design elements. Any boring, simple design can be completely transformed by applying an awesome texture to it. These beautiful patterns are ideal as backgrounds for T-Shirts, packaging, business cards, wedding Invitations, greeting cards, Christmas cards, fashion projects, websites, crafts and so much more! 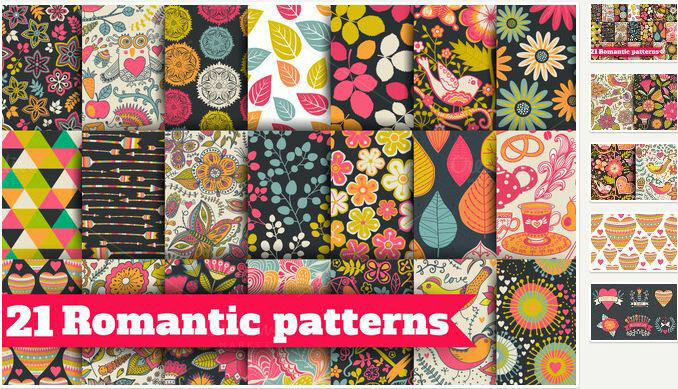 The best thing about these retro patterns is that they are high-quality, have seamless designs and can be downloaded and used for free, in any of your projects. 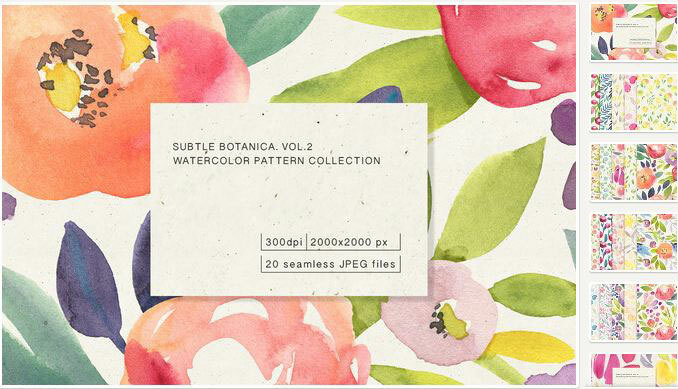 This is a collection of 20 seamless floral watercolor patterns on paper texture. You will get 20 JPEGs 2000×2000, 300 dpi. Whether you want to design a vintage website, an app with a retro style or basically anything inspired by the past, this set will be useful to you! 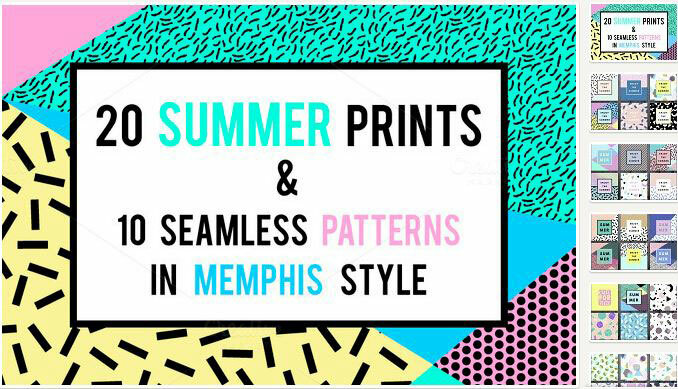 This is a set with geometric, trendy, 80s retro Memphis prints and seamless patterns. 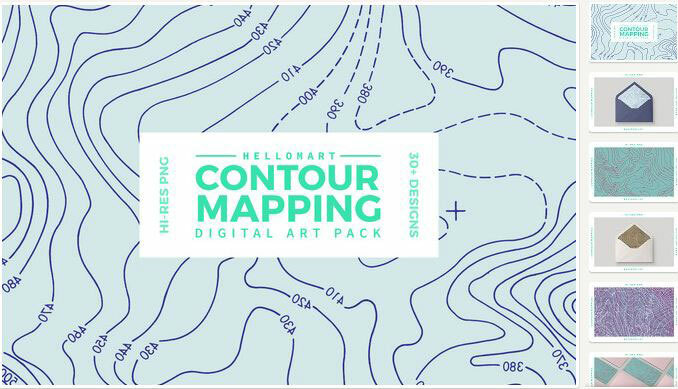 The Contour Mapping digital paper pack includes 30+ design options created from contour maps. They are both colored and black and white and each image is 12×12 or larger, at 300 dpi. 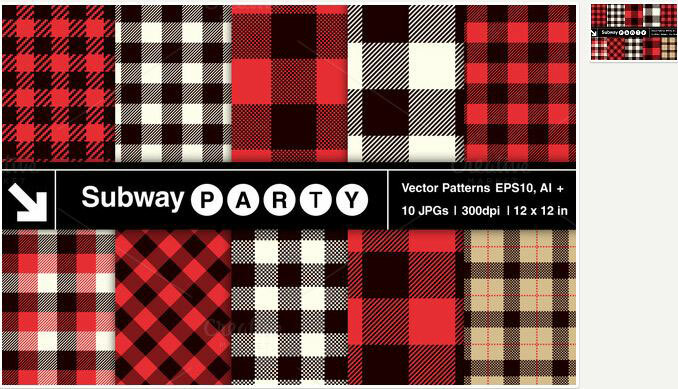 Get 10 seamless lumberjack plaid vector patterns (EPS, Ai) in various colors. Perfect for hipster designs. 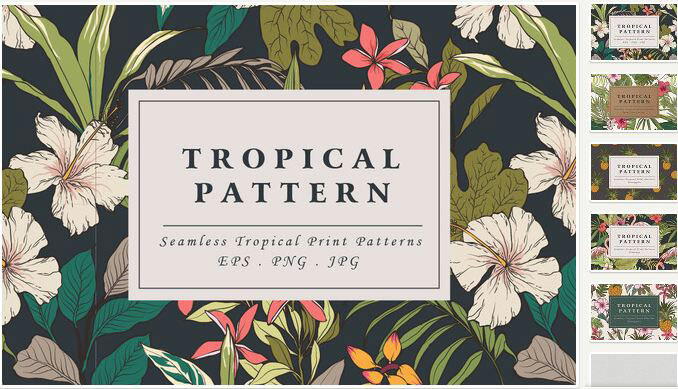 This is a set of 6 seamless vector tropical patterns with pineapples, palm leaves, hibiscus flowers, flamingo birds and a free clip art set! Files Included: EPS; AI; JPG (high resolution 300 dpi); PNG (300 dpi). This is a set with a seamless watercolor pattern with roses that contains 3 EPS10 with a white background, 3 EPS10 with a black background, 3 PNG 5000x5000px with transparent background and 6 JPG 5000x5000px. 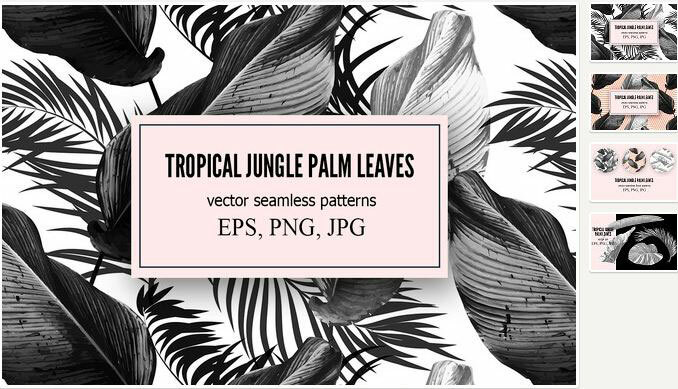 This is a beautiful vector seamless set with floral/tropical patterns with monochrome jungle palm leaves. The tropical vector monochrome palm leaves are isolated on a white background. These vintage patterns can be used to design art deco inspired projects. You can choose between lots of retro textures with colorful, striped, flowered, and tileable designs. 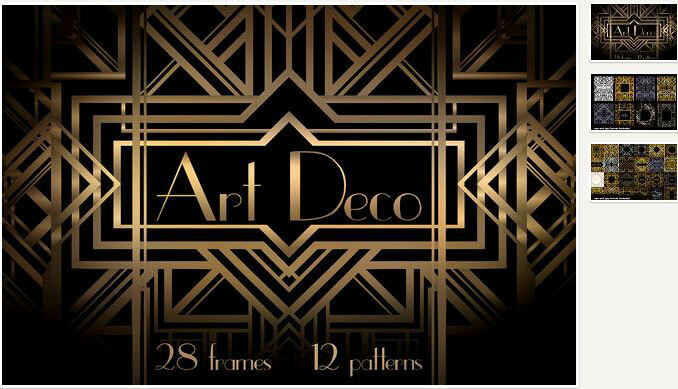 Get 23 frames and 8 seamless patterns with this set, inspired by the beautiful era called The Jazz Age. It is always a good idea for a stylish 1920s themed design! This is a collection of 30 seamless patterns. You can use them for Christmas cards, posters, magazines, packaging and other. 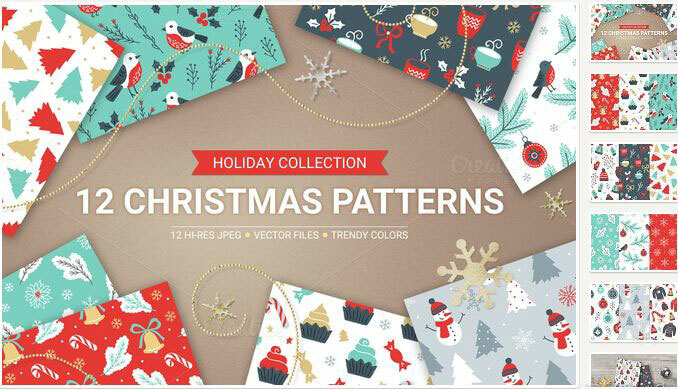 This is a set perfect for Christmas and New Years greeting cards, wallpapers, pattern fills, web page backgrounds, wrapping papers and more. 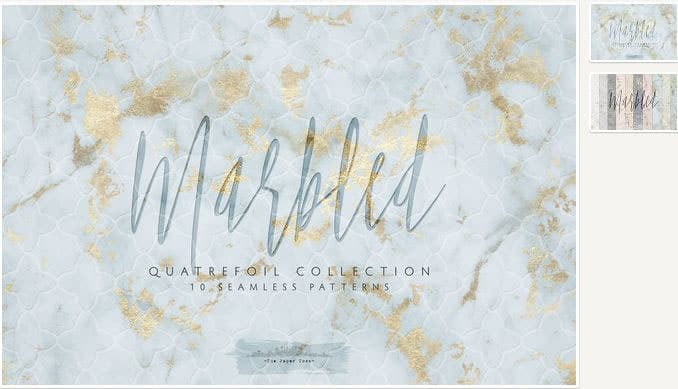 “Marbled” is a collection of 10 seamless backgrounds with engraved quatrefoil patterns on colored marble with platinum/light gold foil. 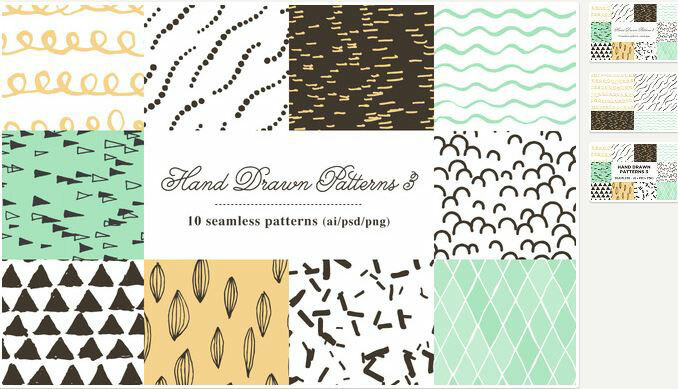 This is a set of 10 hand drawn seamless vector patterns (triangles, waves, curls, dots etc.) to give your design an authentic vintage touch. 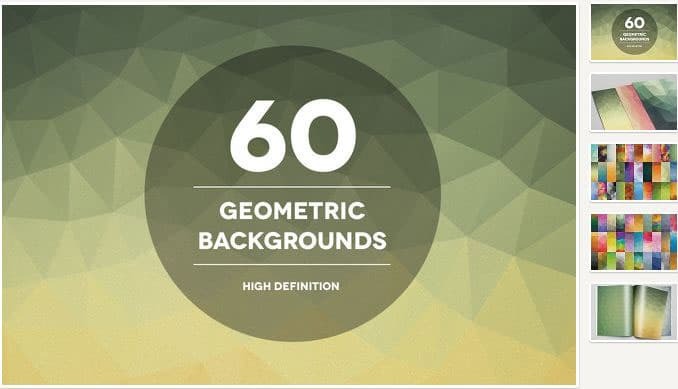 This is a set of 60 high definition geometric backgrounds that you can use for websites, illustrations, and posters. All 60 backgrounds come in both .AI and .JPG formats. 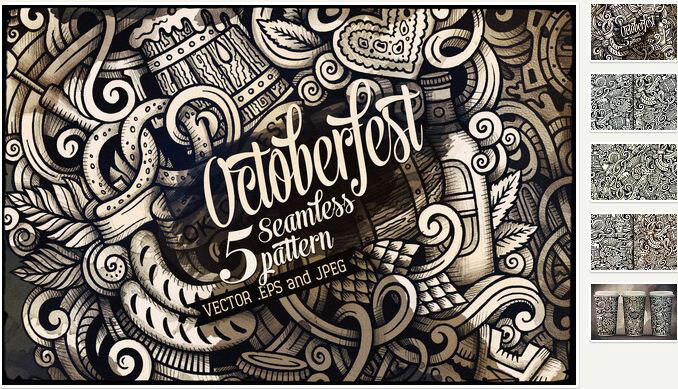 This is a set of 5 graphics with hand-drawn OKTOBERFEST doodles. These are vector seamless patterns. This is a fresh pack of different cards, posters, headers, seamless patterns. 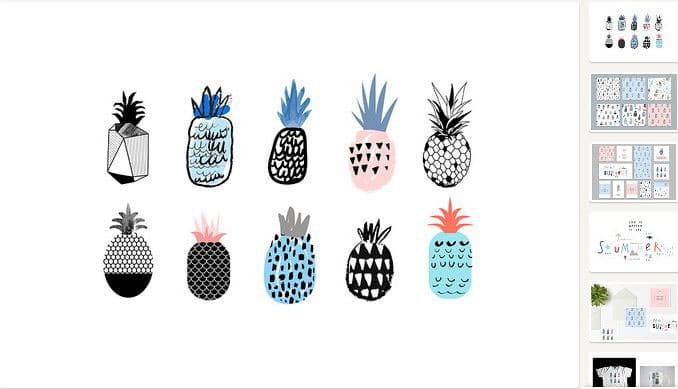 Feel the summer with these cute designs! 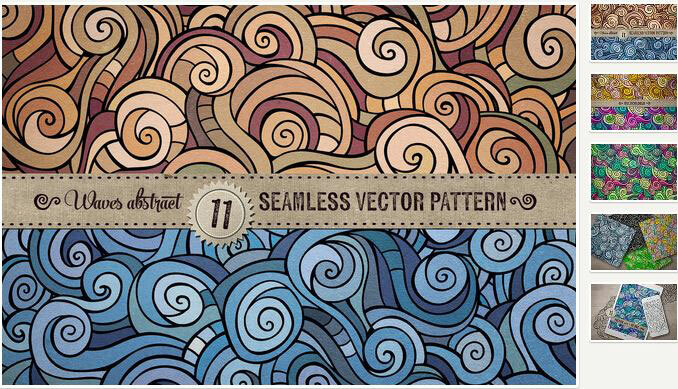 This is a set of 10 seamless abstract hand-drawn waves and curls patterns, that come in different color options and layout. You will receive 10 EPS vector patterns, RGB and 10 JPEG files (5000?5000 pixels) RGB. 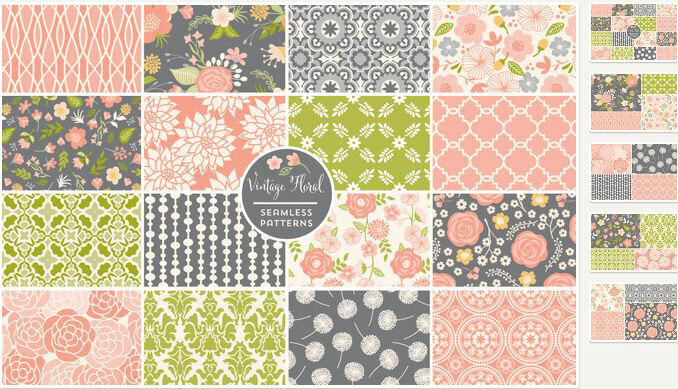 This is a set of seamless, vector patterns that are easy to scale and recolor! 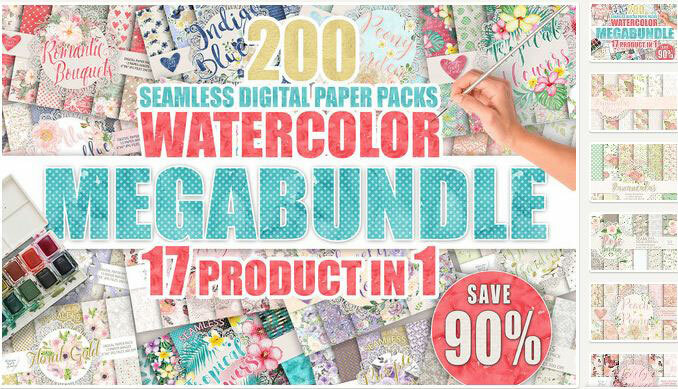 This product includes patterns as digital papers in both JPEG (8.5 X 11 inch, 300 dpi) as well as PNG formats! This is a set of vector seamless floral damask patterns. Get these royal Victorian seamless patterns for wallpapers, textile, wrapping, wedding invitation. The Zip archive includes 6 EPS files and 6 JPG files. 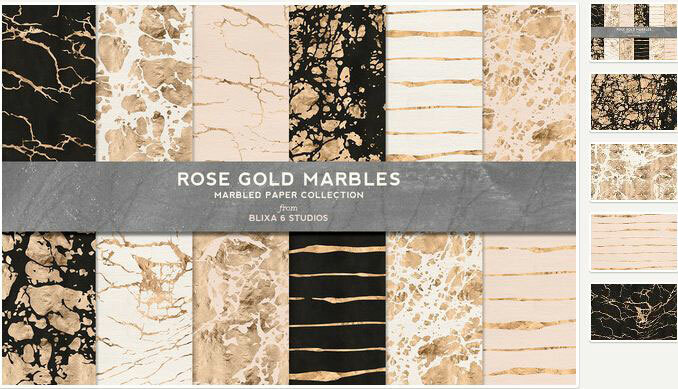 This is a set you can use to make your own shimmery rose gold leafed note cards, gift tags, wrapping paper, canvas bags, t-shirts, scrap book collages, wedding party invites and more. 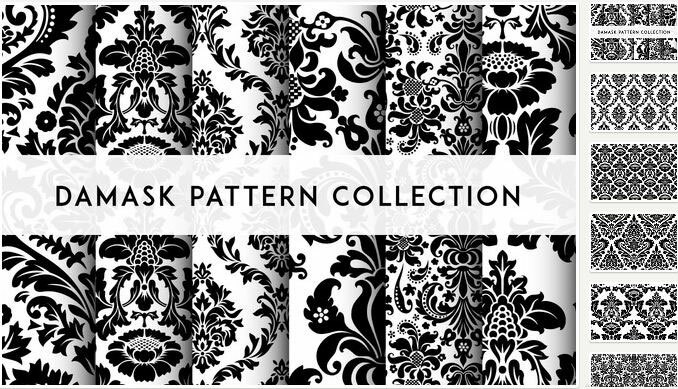 This is a set that can be used for wallpaper, pattern fills, web page background, surface textures. Perfect for making wedding invitations, birthday cards, scrapbooking, party decorations, invitation cards, and more. This is a vector pattern set that includes 21 patterns + BONUS 6 doodle elements for Valentine’s Day. 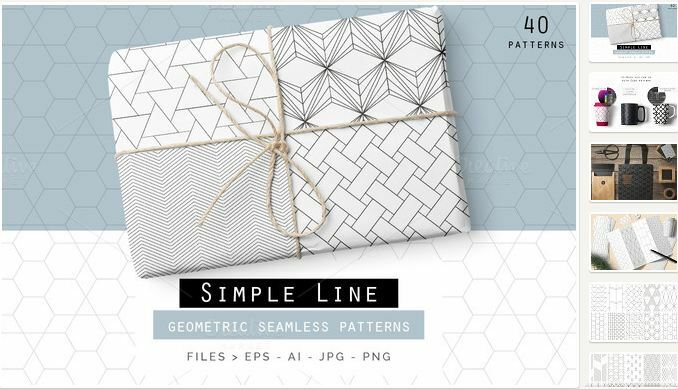 You will receive:21 EPS files with vector patterns + 1 eps file with doodle set, 21 JPEG files (2500?2500 pixels, 300dpi), 21 PNG files (2500?2500 pixels, 300dp). This is a lovely collection of floral and geometric backgrounds. 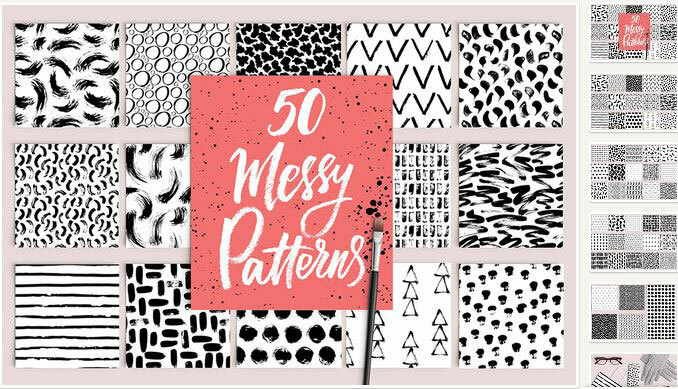 These patterns are perfect for creating wedding invitations, stationery, bridal shower decor and more! You will receive 1 EPS file saved in version CS2, 1 AI file saved in version CS2 and 16 JPG files measuring 12″ x 12″ (300 dpi). 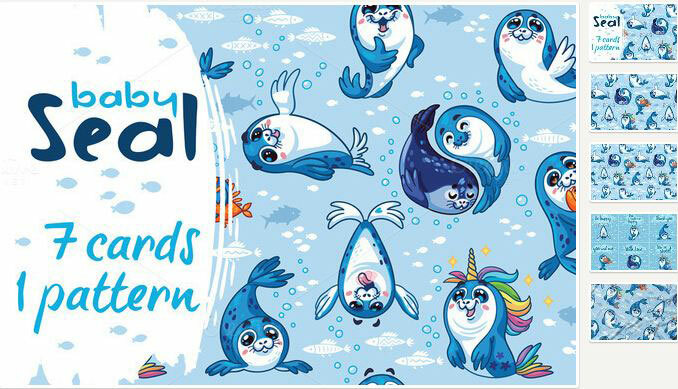 This set includes 1 seamless patterns and 7 cards with Baby Seal, 1 EPS10 (Pattern) + 1 PDF + 1 JPG image (4000px X 4000px X 300dpi), 7 EPS10 (Cards) + 7 PDF + 7 JPG image (4000px X 4000px X 300dpi). 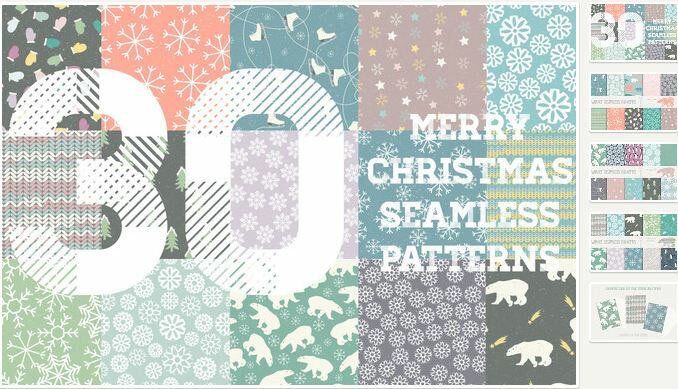 10 .jpeg seamless patterns (300dpi). 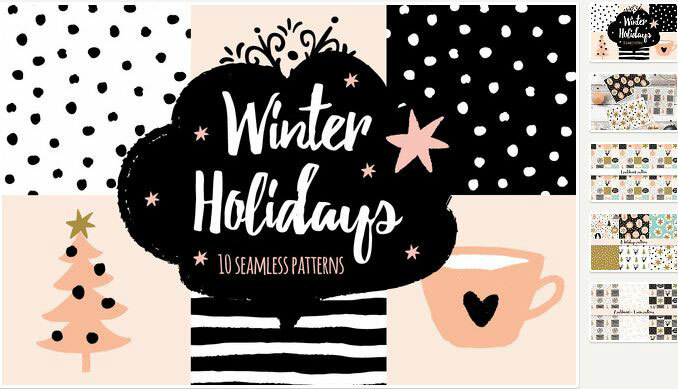 This is a set for winter holidays with 10 seamless patterns with elements such as snow, stars, trees and cute winter patchworks! 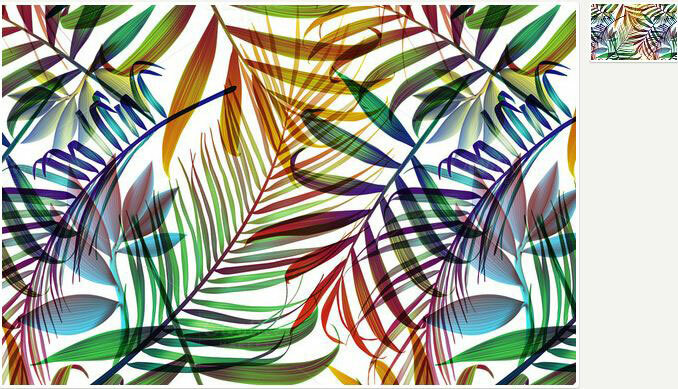 This is a set of seamless, colorful, tropical palm leaves backgrounds, These come in a large size at 42.3 x 42.3cm 300dpi. 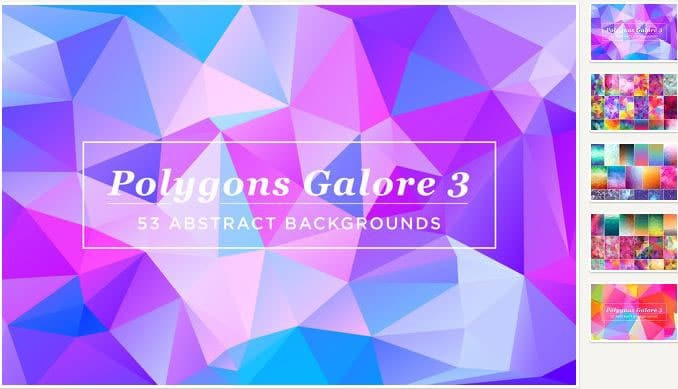 20 Gorgeous HQ Background Packs – Free Downloads!